6U/T-Softball: is for participants’ 5 and 6 year olds (cut-off January 1st), who are new to the game of softball and will develop the fundamentals of throwing, hitting, and fielding. In Tee Softball, players will primarily use a batting tee and some coach pitch depending on the progress of the girls. Rules of the game may be varied to accommodate the need for proper instruction and teaching. 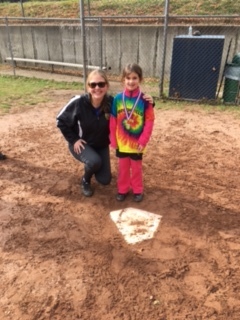 The primary goals: of Tee Softball are to instruct the girls in the fundamentals of the game of softball and to allow them to experience the value of teamwork. Team rosters are suggested to be smaller to allow for more engagement. The diamond to be used is suggested at 50 foot. Scores are not kept during games at this level, and games will be played against other Tee Softball teams in Brookfield. Equipment required: at this level includes a helmet, bat, and glove. The teaching at the Tee Softball level sets the girls’ foundation as ball players and will enable them to comfortably move up through Brookfield Softball.